Pyrrole-imidazole (Py-Im) polyamides are nuclease-resistant novel compounds that inhibit gene expression by binding to the minor groove of DNA. 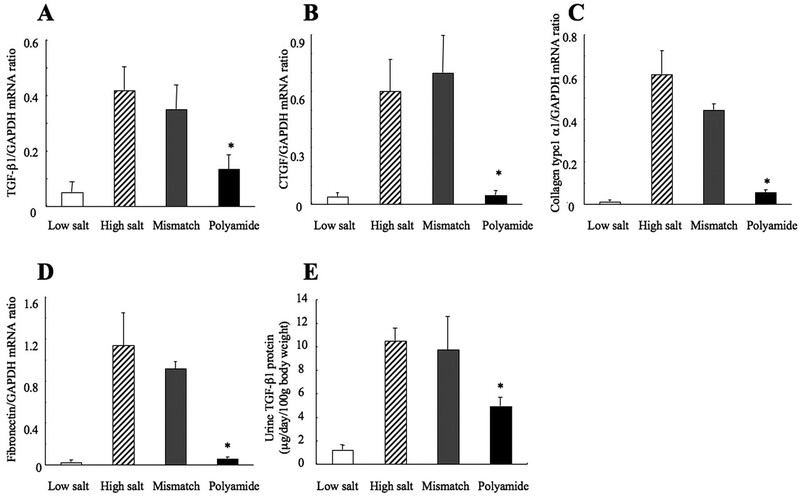 A Py-Im polyamide that targets rat TGF-β1 was designed as a gene-silencing agent for progressive renal diseases, and the distribution and the effects of this polyamide on renal injury were examined in Dahl-salt sensitive (Dahl-S) rats. For identification of transcription factor binding elements for activation of the rat TGF-β1 gene, recombinant TGF-β1 reporter plasmids were transfected into HEK-293 cells, and promoter activity was measured. Py-Im polyamide was designed to the activator protein-1 binding site of the rat TGF-β1 promoter. This Py-Im polyamide showed strong, fast, and specific binding to the target DNA in gel mobility shift and Biacore assays. Py-Im polyamide significantly inhibited TGF-β1 promoter activity and expression of TGF-β1 mRNA and protein in rat mesangial cells. Intravenously administered fluorescein-labeled polyamide distributed to the kidney of rats. Py-Im polyamide significantly inhibited expression of TGF-β1 mRNA and protein in the renal cortex of Dahl-S rats and reduced the increase in urinary protein and albumin in Dahl-S rats independent of changes in blood pressure. These results indicate that Py-Im polyamide that targets TGF-β1 will be a novel gene-silencing agent for the TGF-β1–associated diseases, including progressive renal diseases. The use of reverse genetics to inactive genes can aid in the elucidation of gene function and may also be helpful in the treatment of viral infections, cancer, and other diseases that involve aberrant gene expression. Gene function can be inactivated at the DNA level by homologous recombination and at the RNA level by antisense DNA, ribozymes, and siRNA. However, these compounds are degraded easily by nucleases. Therefore, suitable chemical modifications or drug-delivery systems are necessary for their therapeutic applications. Pyrrole-imidazole (Py-Im) polyamides first were identified from duocarmycin A and distamycin A, which recognize and bind DNA with sequence specificities and are small synthetic molecules that are composed of the aromatic rings of N-methylpyrrole and N-methylimidazole amino acids (1–3). Synthetic Py-Im polyamides bind to specific nucleotide sequences in the minor groove of double-helical DNA with high affinity and block binding of specific proteins. Therefore, Py-Im polyamides may be useful tools in molecular biology medicine. Py-Im polyamides are resistant to nucleases and do not require particular delivery systems (4). Various types of sequence-specific DNA-binding Py-Im polyamides have been developed to regulate gene expression by targeting the promoter regions of enhancer and transcription factor binding elements (5). Binding of enhancers to the major and minor grooves of DNA can be inhibited by the minor groove-binding Py-Im polyamides (6). DNA recognition by Py-Im polyamides depends on a code of side-by-side pairing of Py and Im in the minor groove; pairing of Im opposite Py (Im/Py) targets a G-C base pair, and Py/Im targets a C-G base pair. Py/Py targets either a T-A or an A-T base pair (3). The binding constants and specificity of Py-Im polyamides are comparable to those of transcription factors. Dickinson et al. (7) reported the genes of the HIV were silenced by Py-Im polyamides to their regulatory sequences. A number of studies have identified TGF-β1 as a critical factor in kidney diseases such as glomerulosclerosis (8) and mesangioproliferative glomerulonephritis (9,10). TGF-β1 stimulates the proliferation of mesangial cells and the production of extracellular matrix (11,12). TGF-β1 has been reported to induce Thy-1–associated nephritis (13), diabetic nephropathy (14), and interstitial nephritis associated with obstructive nephropathy (15) in rats. TGF-β1 was reported recently to induce epithelial-mesenchymal transformation in renal tissue, which plays a critical role in the pathogenesis of nephritis (16). Thus, TGF-β1 induces nephrosclerosis and interstitial nephropathy by its effects on mesangial cell growth, extracellular matrix formation, and epithelial-mesenchymal transformation. TGF-β1 is expressed highly in various animal models of progressive renal disease such as hypertensive renal sclerosis, diabetic nephropathy, and focal renal sclerosis (17–20). Dahl salt-sensitive (Dahl-S) rats show glomerulosclerosis, which is known to be associated with TGF-β1 (17). To develop a novel gene-silencing agent for the treatment of progressive renal diseases, we designed and synthesized a Py-Im polyamide targeting TGF-β1 and examined its distribution and effects on TGF-β1 expression and renal injury in Dahl-S rats. This study conformed to the standards of the Guide for the Care and Use of Laboratory Animals published by the National Institutes of Health (NIH Publication No. 85-23, revised 1996). Polyamide targeting rat TGF-β1 (polyamide) was designed to span the boundary of the activator protein-1 (AP-1) binding site (−2303 to −2297) of the TGF-β1 promoter (Figure 1A). Numbering refers to the start of the open reading frame as +1 (21). Mismatch polyamide (mismatch) was designed not to bind transcription binding sites of the promoter. Polyamides were synthesized according to previously described methods (22) (Figure 1B). Target sequence and structure of the synthetic pyrrole-imidazole (Py-Im) polyamide that targets the rat TGF-β1 promoter. (A) The polyamide was designed to bind to the rat TGF-β1 promoter adjacent to the activator protein-1 (AP-1) binding site (−2303 to −2297) in the −2424 to −2153 region of the deletion mutant. (B) Structure of the rat TGF-β1–specific polyamide and mismatch polyamide (mismatch). Mismatch was designed not to bind transcription binding sites of the promoter. Polyamides were synthesized by solid-phase methods and were purified by HPLC (0.1% AcOH/CH3CN 0 to 50% linear gradient, 0 to 40 min, 254 nm through a Chemcobond 5-ODS-H column). Fluorescein-labeled DNA corresponding to −2289 to −2310 including the AP-1 binding site and 2-bp mutated DNA were synthesized for gel mobility shift assays. One micromole of the DNA was incubated with 50 μM polyamide or mismatch for 1 h at 37°C. Moreover, fluorescein-labeled appropriate DNA was incubated with polyamide or mismatch, and then it was incubated with AP-1 extract (Promega, Madison, WI) again. Those resulting complexes were separated by electrophoresis and visualized by luminescent image analyzer LAS-3000 (Fujifilm, Tokyo, Japan). Kinetics of binding of polyamide and mismatch to target sequence were assessed by surface plasmon resonance technique with a molecular interaction model. Biotin double-strand DNA was immobilized to streptavidin-functionalized sensorchip SA (Biacore, Uppsala, Sweden). Measurements of binding curves of polyamide or mismatch to the DNA and data processing were performed on a Biacore X (Biacore) according to recommended protocols. Rat TGF-β1 promoter cloned into the KpnI site of the pGL3-basic vector was a gift from Dr. Kyoung Lim (Ajou University School of Medicine, Suwon, Korea). The promoter deletion mutant (−2676 to 72) was cleaved with KpnI and BpuI102I and self-ligated to the promoter-pGL3-basic vector fragment with DNA blunting kit (TaKaRa; Otsu, Shiga, Japan). Other deletion mutants were generated by cleaving with KpnI and SacI, XhoI, PvuII, Van91I, NsiI, BstPI, SacII, or Bsu36I to obtain promoter terminating at −2424, −2153, −1715, −1474, −1327, −1104, −742, and −513 to 72. HEK-293 cells were seeded onto 24-well plates and grown in DMEM (Sigma-Aldrich, St. Louis, MO) with 20% calf serum. At 70 to 90% confluence, a mixture of reporter plasmid (1 μg/well) and phRG-TK vector (0.01 μg/well; Promega) as an internal control was used to transfect cells with Lipofectamine2000 (Invitrogen, Carlsbad, CA) as described previously (23) and then changed to flesh medium in the presence or absence 1.0 mM phorbol 12-myristate 13-acetate (PMA; Sigma-Aldrich). Cells were incubated for an additional 24 h and scraped into 100 μl of cold lysis buffer (PBS [pH 7.4] and 1 mM PMSF). 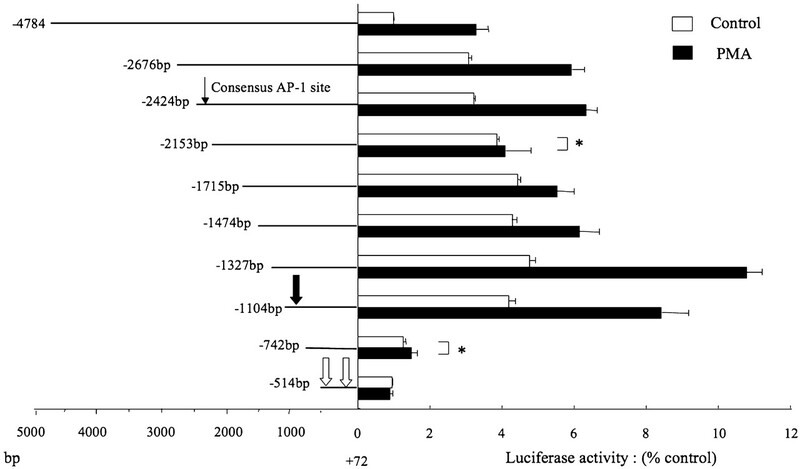 Luciferase activity was measured with a Dual-luciferase reporter assay system (Promega) and a TD-20/20 luminometer (Turner Designs, Sunnyvale, CA) (24). For evaluation of the effect of polyamide on promoter activity, HEK-293 cells were transfected with rat TGF-β1 promoter plasmid and incubated with 0.1 or 1.0 μM polyamide or 1.0 μM mismatch in the presence of 1.0 μM PMA for 24 h. Luciferase activity then was measured. Glomeruli were isolated from the kidneys of 4-wk-old Wistar-Kyoto rats (SHR Corp., Funabashi, Chiba, Japan) by a graded-sieve technique as described previously (25). Mesangial cells were isolated from explants of whole glomeruli according to the differential growth capacities of glomerular epithelial and mesangial cells. Mesangial cells were seeded onto plates and grown in RPMI-1640 medium (Sigma-Aldrich) with 10% FCS. After 24 h, cells were incubated with 2 μM fluorescein-labeled polyamide in RPMI-1640 medium for 2 h. Cells were washed, and fresh RPMI-1640 was added. After 22 h, cells were viewed at ×200 under live cell conditions and then fixed in 4% paraformaldehyde for 10 min. Nuclei were stained with Hoechst 33342 (Invitrogen) and viewed again. Five milligrams of fluorescein-labeled polyamide was injected into Wistar rats (250 g body wt) via the tail vein. After 24 h, the kidneys, aorta, heart, and brain were removed, and frozen specimens were made and viewed at ×200. Subsequently, 50 to 100 mg of each tissue was homogenized in DMSO (Sigma-Aldrich). Each sample was centrifuged and freeze-dried. The precipitate was reconstituted with 50 μl of N,N-dimethylformamide (Sigma-Aldrich). Urine was also collected for 24 h in metabolic cages. Fluorescein-labeled polyamide in 20 μl of N,N-dimethylformamide and 20 μl of urinary samples were subjected to HPLC (0.01% CHO2NH4/CH3CN 0 to 100% linear gradient from 0 to 30 min through a Chemcobond 5-ODS-H column [Chemco Scientific, Osaka, Japan]). Fluorescence was measured with a fluorescence detector (FP-2020 Plus; Nihon Bunko, Tokyo, Japan). Seven-week-old male Dahl-S rats (CLEA Japan, Tokyo, Japan) were used in this study. Rats were divided into two groups and were fed 0.3% NaCl (low-salt [LS]) or 8% NaCl (high-salt [HS]) diet (both from Oriental Yeast, Tokyo, Japan) ad libitum for 2 wk. 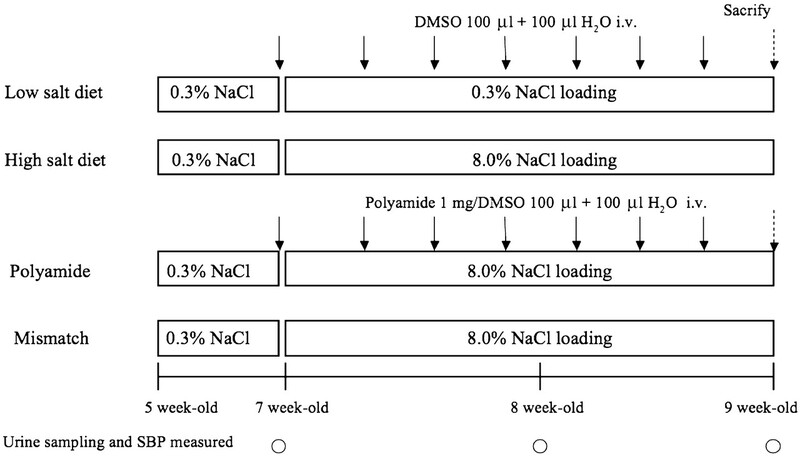 One milligram of polyamide or mismatch was dissolved in 100 μl of DMSO plus 100 μl of H2O and injected via the tail veins of HS rats every 2 d for 2 wk (total 7 mg of polyamide per rat). Control rats received injections of 100 μl of DMSO plus 100 μl of H2O (Figure 2). Systolic BP (SBP) was measured by the tail-cuff method. Urine was collected in metabolic cages for 24 h every week. Urinary protein and albumin excretion were determined with a Bio-Rad protein assay kit (Bio-Rad, Hercules, CA). Experimental protocols for administration of Py-Im polyamide that targets TGF-β1 to Dahl-salt sensitive (Dahl-S) rats. For in vitro experiments, mesangial cells were incubated with 0.1 or 1.0 μM polyamide or 1.0 μM mismatch in the presence of 1.0 μM PMA in RPMI-1640 medium with 0.5% FCS for 8 h. Total RNA was isolated and reverse-transcribed as described previously (18). For in vivo experiments, total RNA was isolated from 20 mg of renal cortical tissue from Dahl-S rats and reverse-transcribed. Real-time quantitative PCR was performed with cDNA diluted four times and TaqMan Universal Master Mix and an ABI 7500 sequence detector (Applied Biosystems, Foster City, CA) according to the manufacturer’s instructions. Assay-on-Demand primers and probes (TGF-β1, Rn00572010-m1; connective tissue growth factor [CTGF], Rn00573960-g1; collagen type 1 α1, Rn00801649-g1; fibronectin, Rn00569575-m1 and TaqMan Rodent GAPDH control reagents) were purchased from Applied Biosystems. Real-time PCR data were analyzed with a standard curve. Correlation coefficients for the standard curves all were >0.90. TGF-β1 protein levels in urine and conditioned medium were determined by enzyme immunoassay (TGF-β1 Emax ImmunoAssay System; Promega) as described previously (26). Mesangial cells were treated with 0.1 or 1.0 μM polyamide or 1.0 μM mismatch in the presence of 1.0 μM PMA for 24 h. Conditioned medium was collected and diluted with TGF-β1 sample buffer. Because this assay detects only active TGF-β1 protein, each sample was acidified to convert latent TGF-β1 to the active form. Urine samples from Dahl-S rats that were fed an HS diet for 2 wk were collected for 24 h and diluted 1:1000 in sample buffer. Unstained 3-μm-thick paraffin sections of renal cortex were deparaffinized, hydrated, and heated for antigen unmasking. Sections were blocked with Serum Blocking Reagent G (R&D Systems, Minneapolis, MN) for 15 min. The slides then were incubated with diluted primary antibody (mAb to TGF-β1; R&D Systems) for 3 h at room temperature, washed in PBS, and incubated with fluorescein-conjugated polyclonal goat anti-mouse antibody (Dako, Carpinteria, CA) for 30 min at room temperature. After being washed in PBS, sections were incubated with Hoechst 33342 and viewed at ×200. Values are reported as mean ± SEM. A t test was used for unpaired data. Two-way ANOVA and Duncan multiple range tests were also used. P < 0.05 was considered statistically significant. For identification of transcription factor elements that are responsible for activation of the rat TGF-β1 gene, a rat TGF-β1 promoter-pGL3-basic luciferase reporter chimeric plasmid was created (Figure 3). The start site of the rat 2.5-kb TGF-β1 transcript (892 nucleotides upstream of ATG) (24) is at a position homologous to that of human TGF-β1 (858 and 852 nucleotides upstream of ATG) (27) and mouse (856 nucleotides upstream of ATG) (28). A comparison of this conserved region with that of other species revealed 91.4% overall identity with the mouse sequence and 81.7% identity with the human sequence (29). Deletion analysis of TGF-β1 promoter activity. Bars indicate the upstream region of the TGF-β1 gene. Bold arrow indicates the start site for the 2.5-kb transcript as identified previously in mice. Open arrows indicate the start sites for the 1.9-kb transcript and 1.4-kb transcript in rats. HEK-293 cells were transfected with recombinant plasmids and stimulated with 1.0 μM phorbol 12-myristate 13-acetate (PMA). The transcription factor binding sites between −2424 and −2153 were searched with TFSEACH. Narrow arrow indicates the consensus AP-1 binding site at −2303 to −2297 upstream of ATG. *NS versus control with PMA. Deletion of −742 markedly reduced promoter activity compared with deletion of −1104 in the presence or absence of PMA. Deletion of −2153 reduced promoter activity compared with deletion of −2424 in the presence of PMA. There was no significant difference in promoter activity between the deletion of −2153 and −2424 in the absence of PMA, and deletion of −2153 was not affected by PMA. These results suggest that the −1104 to −742 region contains the basal transcriptional regulatory element and the 2.5-kb transcription start site and that the −2424 to −2153 region contains a highly sensitive PMA response element. We searched for transcription factor binding sites between −2424 and −2153 with TFSEACH (http://mbs.cbrc.jp/research/db/TFSEARCH.html) (30). This region contained an AP-1 binding site (−2303 to −2297). Polyamide was designed to bind to this region (Figure 1A). Gel mobility shift and Biacore assays allow for the determination of the binding affinity and specificity of polyamides for target DNA. 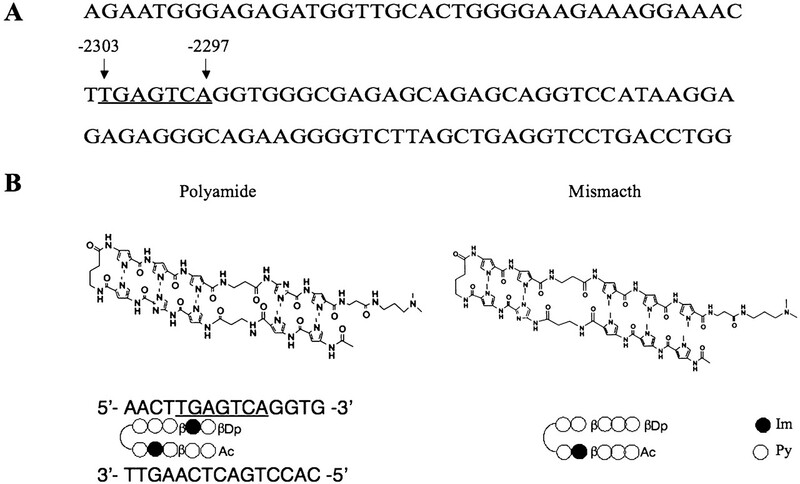 Polyamide bound the appropriate 21-bp double-stranded DNA but did not bind the 2-bp mutated DNA, whereas mismatch did not show binding to appropriate DNA (Figure 4A). As shown in Figure 4B, a single mobility band was observed when the DNA were incubated with AP-1 or treatment with mismatch. Polyamide inhibited AP-1 binding to target DNA. (A) Gel mobility shift assay. Fluorescein-labeled DNA corresponding to the AP-1 binding site (5′-GGAAACTTGAGTCAGGTGGGC) and 2-bp mutated DNA (5′-GGAAAGGTGAGTCAGGTGGGC) were synthesized and incubated with Py-Im polyamides for 1 h at 37°C and loaded onto a 20% polyacrylamide gel. Lane 1, single-stranded DNA; lane 2, double-stranded DNA; lane 3, DNA with polyamide targeting TGF-β1 (polyamide); lane 4, 2-bp mutated DNA with polyamide; lane 5, DNA with mismatch polyamide (mismatch). (B) After the fluorescein-labeled appropriate DNA was incubated with polyamides, the resulting complexes were incubated with AP-1 extract for 30 min at 37°C and loaded onto a 4% polyacrylamide gel. Lane 1, double-stranded DNA; lane 2, DNA with AP-1; lane 3, DNA with polyamide; lane 4, DNA with polyamide and AP-1; lane 5, DNA with mismatch; lane 6, DNA with mismatch and AP-1. Arrows indicate shifted complex. (C and D) Typical surface plasmon resonance sensorgrams for the interaction of polyamide and mismatch with the DNA immobilized on the surface of a sensor chip SA (Biacore assays). The binding response in resonance units is changed with time. The data are fitted to Langmuir double molecular interaction model with mass transport. All experiments were done using the same DNA immobilization level sensor chips in HBS-EP buffer (0.01 M HEPES [pH 7.4], 0.15 M NaCl, 3 mM EDTA, and 0.005% surfactant P20) with 0.1% DMSO at 25°C. Concentrations for polyamide are 0, 1, 5, 10, 20, 30, 50, 75, 100, and 150 nM from lowest to top curves. Concentrations for mismatch are 0, 0.1, 0.2, 0.6, 0.8, 1, 5, 7.5, and 10 μM from lowest to top curves. Figure 4, C and D, shows kinetics of polyamide and mismatch bindings with target double-strand DNA obtained from fitting resulting sensorgrams (Biacore assay). Fast binding of polyamide to the target sequence occurred relative to that of mismatch to allow match binding to reach equilibrium at high concentrations. Dissociation equilibrium constant (KD) was 1.43 × 10−9 and 9.76 × 10−7 M for the interaction of polyamide and mismatch with the DNA, respectively (Table 1). Treatment with PMA significantly increased luciferase activity in HEK-293 cells that were transfected with rat TGF-β1 promoter plasmid. Polyamide was significantly and in a concentration-dependent manner decreased luciferase activity stimulated by PMA (Figure 5A). In mesangial cells, polyamide decreased expression of TGF-β1 mRNA (Figure 5B) and protein (Figure 5C) stimulated by PMA in a concentration-dependent manner. Mismatch did not affect luciferase activity or expression of TGF-β1 mRNA and protein in response to PMA. (A) Effect of polyamide targeting TGF-β1 on rat TGF-β1 promoter activity. Rat TGF-β1 promoter plasmid with luciferase was transfected into HEK-293 cells, and cells were incubated with polyamide in the absence or presence of 1.0 μM PMA for 24 h. Promoter activity was measured with a dual-luciferase reporter assay system. (B) Effect of polyamide on expression of TGF-β1 mRNA and protein in mesangial cells. Mesangial cells from Wistar-Kyoto rats were incubated with polyamide in the presence or absence of 1.0 μM PMA for 8 h. The abundance of TGF-β1 mRNA was determined by real-time PCR analysis. (C) Effect of polyamide on expression of TGF-β1 protein in mesangial cells. Mesangial cells were incubated with polyamide in the presence or absence of 1.0 μM PMA for 24 h. Conditioned medium was collected, and total (latent and active) TGF-β1 protein was measured by ELISA. Values are mean ± SEM (n = 8). *P < 0.05 versus treatment with PMA alone. The distribution of fluorescein-labeled polyamide in mesangial cells after a 24-h incubation is shown in Figure 6A. Fluorescein-labeled polyamide was present in all nuclei by 96 h (data not shown). Distribution of fluorescein-labeled Py-Im polyamide in vitro and in vivo. 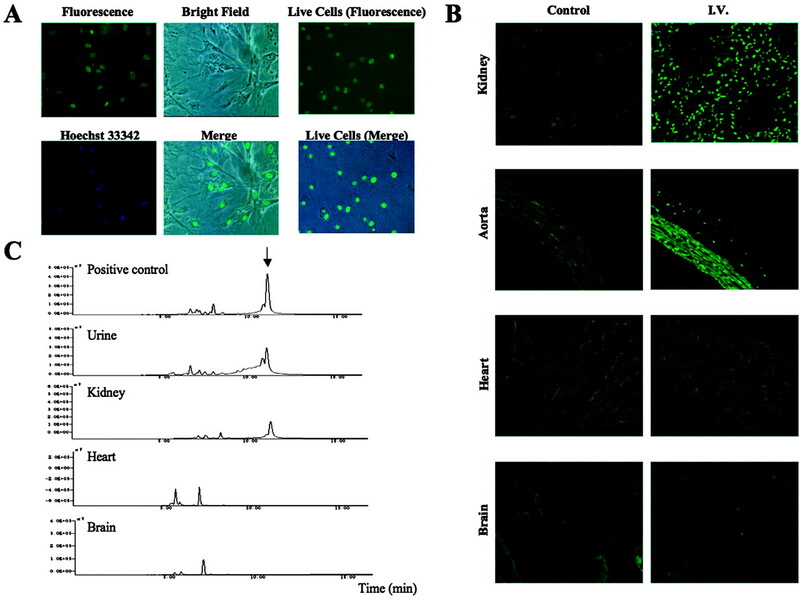 (A) Mesangial cells from Wistar-Kyoto rats were incubated with fluorescein-labeled polyamide and examined by fluorescence microscopy under live cells condition and then fixed and viewed again. Nuclei were stained with Hoechst 33342 (blue). (B) Five milligrams of fluorescein-labeled polyamide was injected into Wistar rats intravenously. Twenty-four hours after injection, the kidneys, aorta, heart, and brain were removed, and frozen specimens were made. (C) HPLC analysis for the fluorescein-labeled polyamide in the urine, renal cortex, aorta, heart, and brain. Fluorescein-labeled polyamide was subjected into HPLC. Arrow indicates fluorescein-labeled polyamide positive control. Magnification, ×200 in A and B. The in vivo distribution of fluorescein-labeled polyamide in the kidney, aorta, heart, and brain 24 h after intravenous injection is shown in Figure 6B. Fluorescein-labeled polyamide strongly localized in nuclei of nephrotubuli and glomeruli. Fluorescein-labeled polyamide also localized in nuclei of aortic midlayer smooth muscle. Fluorescein-labeled polyamide did not distribute considerably in heart or brain. HPLC analysis of fluorescein-labeled polyamide in urine, kidney, aorta, heart, and brain is shown in Figure 6C. Fluorescein-labeled polyamide was clearly detected in urine, kidney, and aorta but not in heart or brain. Intravenous administration of polyamide or mismatch did not affect the body weights of Dahl-S rats (Figure 7A). SBP was remarkably increased in HS rats compared with LS rats. Polyamide or mismatch did not affect SBP (Figure 7B). Both urinary protein and albumin were significantly increased in HS rats compared with levels in LS rats. Treatment with polyamide significantly reduced the increased urinary protein and albumin in HS rats. Mismatch did not affect urinary protein or albumin levels (Figure 7, C and D). 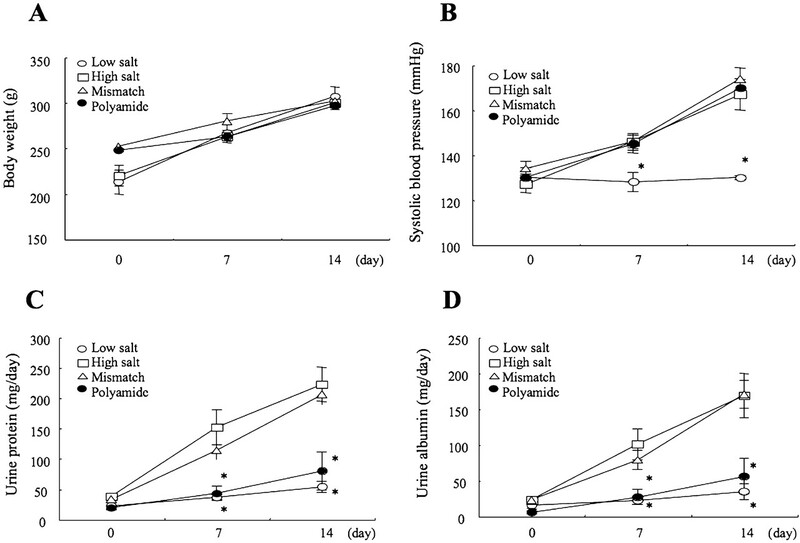 Changes in body weight (A), systolic BP (B), urinary protein (C), and urinary albumin (D) in Dahl-S rats before and after treatments with Py-Im polyamide targeting the TGF-β1 promoter (polyamide). Dahl-S rats were fed a 0.3% NaCl (low salt; ○) or 8% NaCl (high salt; □) diet. Dahl-S rats that were fed a high-salt diet also received an intravenous injection of 1 mg of polyamide (•) or mismatch polyamide (mismatch; ▵) every 2 d (total 7 mg) for 2 wk. *P < 0.05 versus Dahl-S rats that were fed a high-salt diet without polyamide. The effects of polyamide on the expression of TGF-β1, CTGF, collagen type 1 α1, and fibronectin mRNA in the renal cortex of Dahl-S rats are shown in Figure 8, A through D. Expression of these mRNA was significantly higher in HS rats than in LS rats. 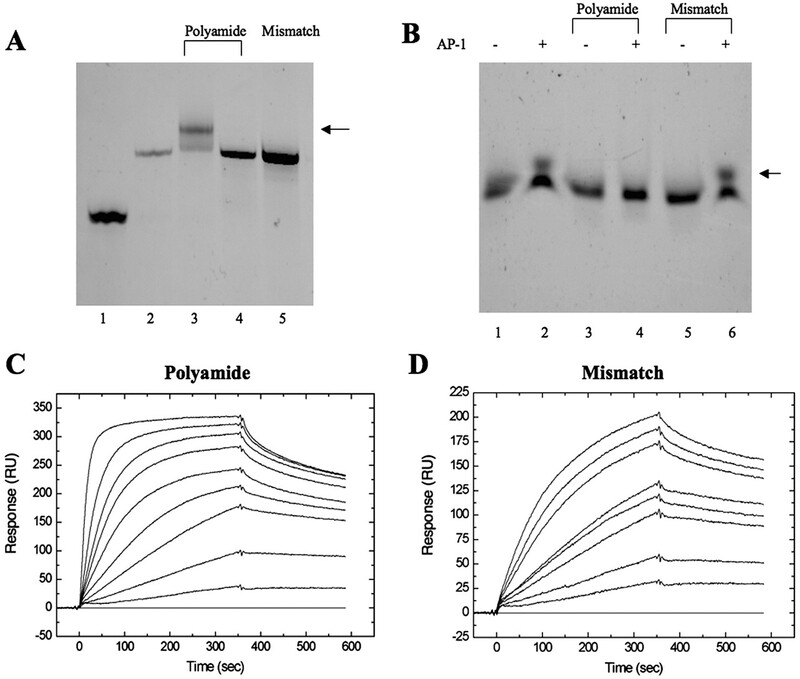 Treatment with polyamide significantly decreased expression of these mRNA in HS rats. Mismatch did not affect expression of these mRNA. (A through D) Effect of Py-Im polyamide targeting the TGF-β1 promoter (polyamide) on the expression of TGF-β1, connective tissue growth factor (CTGF), collagen type 1 α1, and fibronectin mRNA in the renal cortex from Dahl-S rats. Dahl-S rats were fed a 0.3% NaCl (low salt) or 8% NaCl (high salt) diet. Dahl-S rats that were fed a high-salt diet also received an intravenous injection of 1 mg polyamide or mismatch every 2 d (total 7 mg) for 2 wk. Total RNA then was extracted from the renal cortex. The abundance of all mRNA was determined by real-time PCR. (B) Effect of polyamide on the urinary excretion TGF-β1 protein in Dahl-S rats. Two weeks after treatment with polyamide, urine was collected for 24 h. TGF-β1 protein levels were determined by ELISA. *P < 0.05 versus Dahl-S rats that were fed a high-salt diet without polyamide. The effects of polyamide on urinary excretion of TGF-β1 protein in Dahl-S rats is shown in Figure 8E. Urinary excretion of TGF-β1 protein was significantly higher in HS rats than in LS rats. Treatment with polyamide significantly decreased urinary excretion of TGF-β1 protein in HS rats. Mismatch did not affect urinary excretion of TGF-β1 protein in HS rats. Immunofluorescence of TGF-β1 in the renal cortex of Dahl-S rats is shown in Figure 9. TGF-β1 staining in glomeruli and nephrotubuli in HS rats was stronger than that in LS rats. Treatment with polyamide considerably reduced TGF-β1 staining in glomeruli and nephrotubuli in HS rats. Mismatch did not affect TGF-β1 staining. Immunofluorescence analysis of TGF-β1 in the renal cortex of Dahl-S rats that were treated with Py-Im polyamide targeting the TGF-β1 promoter (polyamide). Dahl-S rats were fed a 0.3% NaCl (low salt) or 8% NaCl (high salt) diet. Dahl-S rats that were fed a high-salt diet also received an intravenous injection of 1 mg polyamide or mismatch every 2 d (total 7 mg) for 2 wk. Sections were generated and incubated with an mAb to TGF-β1 and a fluorescein-conjugated polyclonal goat anti-mouse antibody. Nuclei were stained with Hoechst 33342 (blue). Magnification, ×200. Synthetic polyamides have been reported to bind target sites within nucleosomes and may influence chromatin structure (1,2). Because polyamides can be readily designed and synthesized to target any sequence of interest, they may be useful in studies of gene function and perhaps in gene therapy. Polyamides are removed from duplex DNA during transcription; therefore, inhibition of transcription of coding regions is difficult. Polyamides also can inhibit the formation of mRNA in mammalian cells by alkylation of coding regions (31,32). Extensive inhibition of gene expression by alkylating polyamides to a coding region may provide a powerful tool for the gene suppression therapy of viral infections and cancers. Inhibition of gene expression by nonalkylating polyamides that target regulatory sequences is more physiologically relevant than that by alkylating polyamides because this strategy suppresses the enhancing effect of transcription factors and preserves the baseline expression of the target gene. Thus, suppression of gene expression by nonalkylating polyamides may be more efficient in the treatment of chronic nonmalignant diseases. Studies of polyamides have recently focused on the structural characterization of transcription factor–DNA complexes within promoter sequences. To design a polyamide that targets rat TGF-β1, we analyzed the rat TGF-β1 promoter structure and PMA-stimulated activity in promoter deletion mutants. Positive-regulatory elements that were stimulated by PMA were found at bases −2424 to −2153, which contain an AP-1 binding site. AP-1 elements respond to AP-1 transcription factors such as Jun homodimers or Fos/Jun heterodimers, PMA, angiotensin II, and v-Src. Stimulation of TGF-β1 promoter activity occurs by binding to the AP-1 element (33,34). Polyamide targeting TGF-β1 was designed not to cover AP-1 consensus sequences but spans the boundary of AP-1 binding site with the intention of obtaining specificity to the promoter. This polyamide showed strong, fast, and specific binding to the target DNA in gel mobility shift and Biacore assays. Fluorescein-labeled polyamide distributed sufficiently in the kidney without any delivery systems and localized in the nuclei of cultured cells for long periods of time. Best et al. (35,36) reported that fluorescein-polyamide conjugates exhibit good nuclear uptake in a wide variety of cell lines. In our in vivo experiments, polyamide administered intravenously was delivered sufficiently to the kidney and aorta and was localized to nuclei. Thus, this polyamide bound to target DNA in vitro and in vivo. HPLC analysis also confirmed that the presence of polyamide administered intravenously was in the urine, kidney, aorta, liver, and lung. Polyamide was not delivered in heart and brain. It is possible that the differentiated cardiac tissue does not express TGF-β1 in normal heart, and this polyamide does not pass through the blood-brain barrier. Nucleic acid medicines such as antisense DNA, ribozymes, and decoy have been developed as gene-silencing agents. Decoys, in particular, inhibit the binding of target transcription factors in a manner similar to polyamides. However, because these agents are degraded easily by nucleases, they require drug-delivery systems for sufficient distribution into organs. Because polyamides are completely resistant to nucleases and can be delivered into organs without delivery systems, polyamides will be more feasible gene-silencing medicines. Dahl-S rats are useful models of human progressive renal disease. Dahl-S rats develop severe hypertension, glomerulosclerosis with thickening of capillary artery walls, and interstitial fibrosis in response to salt loading. Tamaki et al. (17) reported increased levels of TGF-β1, plasminogen activator inhibitor-1, fibronectin, and collagen type 1 in the renal cortex of Dahl-S rats. In these experiments, expression of TGF-β1 mRNA and protein was enhanced in the renal cortex of HS rats. Treatment with polyamide significantly inhibited this increased expression of TGF-β1 mRNA and protein. Expression of mRNA for CTGF, a potent growth factor that stimulates the proliferation of mesenchymal cells, including mesangial cells, and induces the production of extracellular matrix downstream of TGF-β1 signaling (37–39), was inhibited by polyamide. However, when cell cultures were treated with exogenous TGF-β1, polyamide did not block CTGF production. Because the CTGF promoter also has an AP-1 site, this finding further supports the specificity of polyamide for the TGF-β1 promoter. Expression of downstream extracellular matrix components such as collagen type 1 and fibronectin were also increased in the renal cortex of HS rats. This, too, was suppressed significantly by treatment with polyamide. In addition, the increased urinary protein and albumin in HS rats was significantly decreased by treatment with polyamide without a reduction in BP. These findings suggest that the polyamide ameliorated the renal damages by inhibition of TGF-β1 in organs and extracellular matrix components in the renal cortex of Dahl-S rats. In our study, although an HS diet did not induce considerable renal damage in Dahl-S rats during a 2-wk period, treatment with polyamide significantly suppressed TGF-β1 immunofluorescence in the glomeruli and nephrotubuli of HS rats. Dahly et al. (40) injected anti–TGF-β antibody into salt-loaded Dahl-S rats every day for 2 wk and found a significant decrease in BP, proteinuria, and degree of glomerulosclerosis and renal interstitial fibrosis. 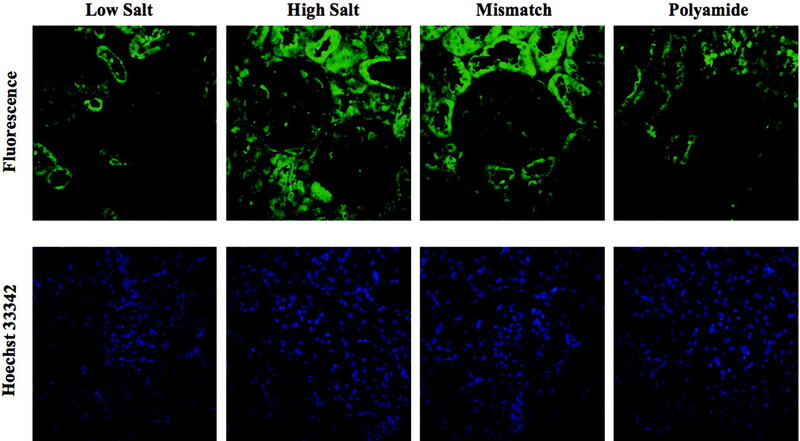 Polyamide completely inhibited the increases in proteinuria and albuminuria in salt-loaded Dahl-S rats, along with suppression of TGF-β1 staining in glomeruli and nephrotubuli. These findings suggest that polyamide may be feasible gene-silencing agent for the treatment of progressive renal diseases. We believe that polyamides will be important gene-silencing agents in the postgenome era. Polyamides can be readily designed and synthesized to target any gene. In the future, control of gene expression by polyamides may ameliorate diseases that are not treatable with current medicines. This work was supported in part by Grants-in-Aid from the Japanese Ministry of Education, Science, Sports, and Culture of Japan (15590863).